University of Southern Queensland’s VFair is a chance to get on to a new campus and take advantage of a diverse set of students so if USQ hasn’t been part of your student engagement strategy it’s now easier than ever and best of all it’s free too. After a successful pilot in 2017, The USQ VFair has returned for 2018. 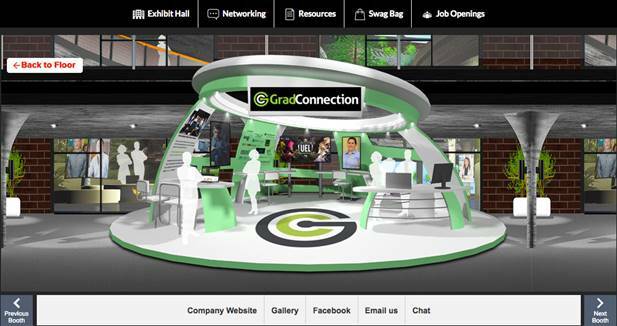 Here at GradConnection we have seen mixed results from Virtual Fairs initiatives but in the case of more regionally located universities like USQ we have seen this as a great way to get exclusive access to a large pool of students who might have previously had lower visibility of your recruitment campaigns. We’ll be taking part for 2018 again and our team will be chatting to USQ students from our office so we hope to see you there! Expressions of interest to participate in VFair are now open. Complete your expression of interest online now at AcceSS to secure your booth. You must be a registered AcceSS/CareerHub user to complete an online registration. You can register here.